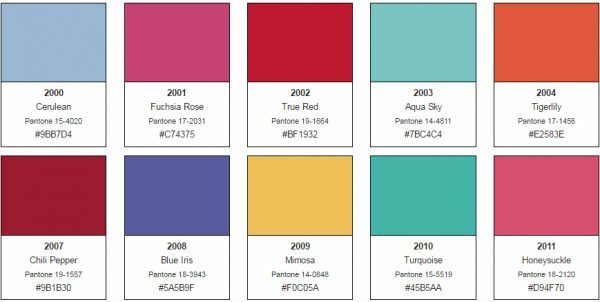 Some color cataloging systems have evolved around names that are easier to remember and communicate, from the somewhat abstract (“New Old Rose”) to those more grounded in nature (“Robin Egg Blue). But in the digital age, a different approach to color categorization has become particularly important: sorting by number. Current systems like CMYK (Cyan, Magenta, Yellow & Key [aka Black]), RGB (Red, Green & Blue) and hexadecimal (a six-figure alphanumeric representation of RGB) grew out of this mathematical line of inquiry. Like nature-based naming, the evolution of numbering systems also involved a particularly key figure from the turn of the 20th Century. 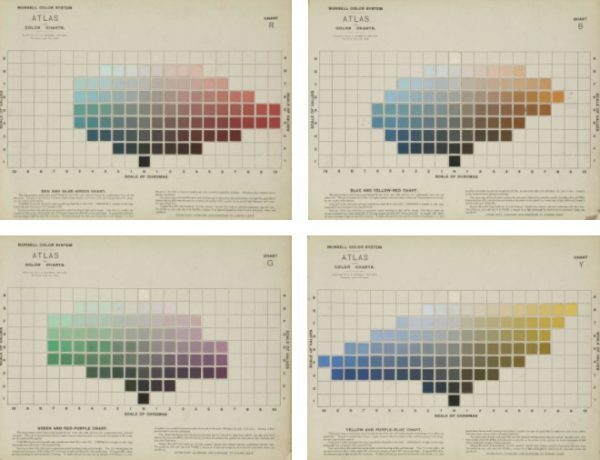 Professor and artist Albert Henry Munsell viewed word-based naming systems as “foolish and misleading.” In colorimetry, what has become known as the Munsell Color System redefined colors along three dimensions: hue, value (lightness), and chroma (purity). 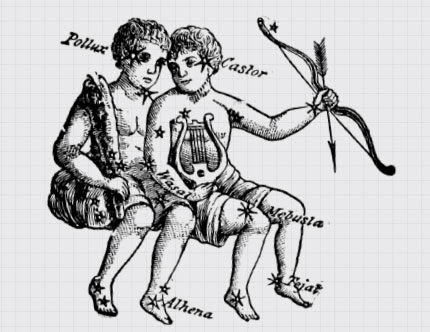 His early work was published in A Color Notation in 1905. 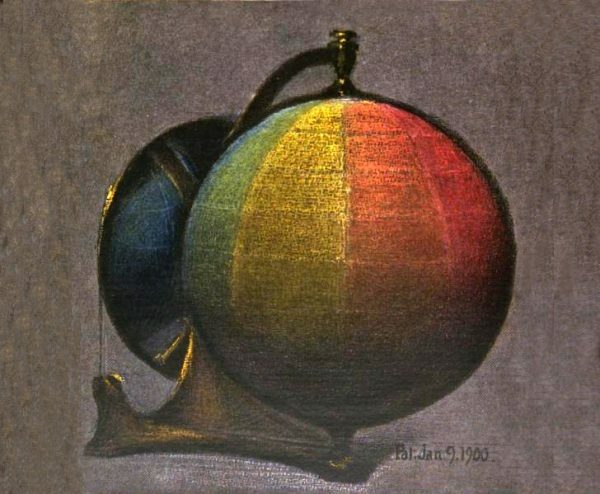 Munsell represented his three dimensions of color using a familiar geometric form: a color sphere. Each dimension was assigned a numeric value, positioning it in “color space” in much the same way X, Y and Z coordinate systems position points in physical space. 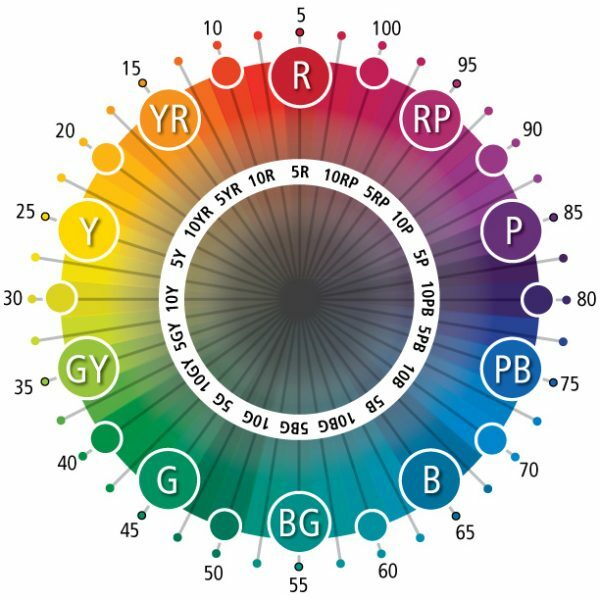 In two-dimensional form, hues are measured in degrees, spread out around a circle (like a color wheel). Chroma, in turn, radiates outward from neutral gray (as shown above). Value moves up the vertical axis toward white and down toward black (as shown below). 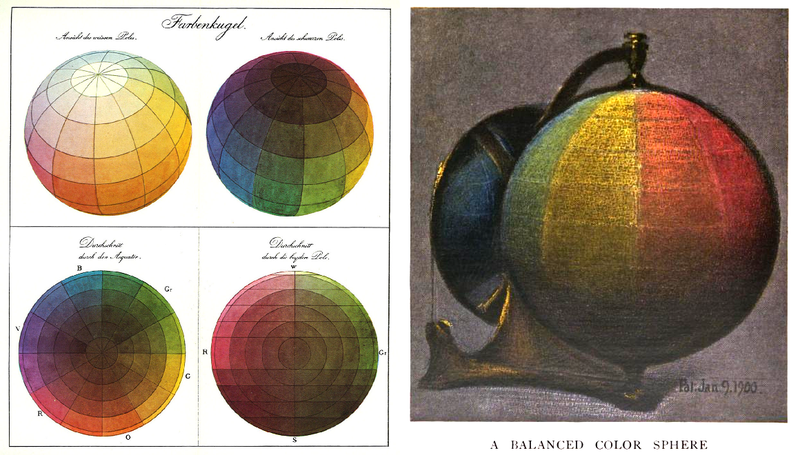 The idea of representing colors in space predated Munsell — others had proposed tilted cubes, pyramids, hemispheres and spheres, but their work was generally incomplete or theoretical. Munsell developed his system based on rigorous measurements of human perception. As he evolved this approach for other practical applications, Munsell also consulted with educational administrators in Boston to develop a Color Education Primer. This guide would help teach children to describe and locate colors in relation to other colors. Decades after his death, his company was dissolved but the Munsell Color Foundation was founded to further color research and education. Naming colors after nature has a lot of everyday advantages and popular applications. 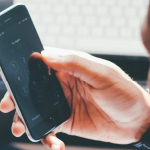 This approach can help people recognize, remember and communicate by recalling visuals rather than just reciting abstract strings of digits. 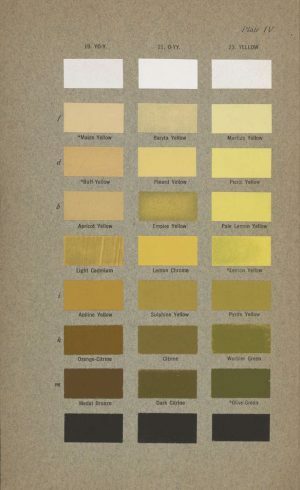 Championed by people like ornithologist Robert Ridgeway, this line of inquiry may have come to different conclusions but was motivated by a similar desire to make color identification more rational and comprehensible. Still, Munsell anticipated that numeric systems would be essential to describing and charting a larger number possible combinations. Among other advantages, new colors can always be added to this system simply by establishing their position in 3D space — the spatial model can always be subdivided further as needed. 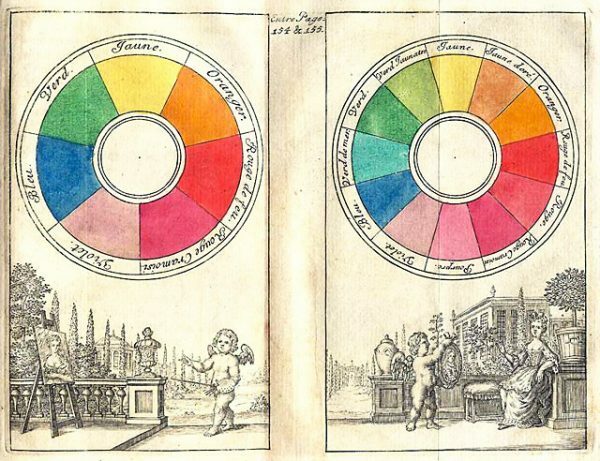 Munsell also saw his method as a bridge between art, science and color education — with it, he could create a useful language of color as universal as musical notation. 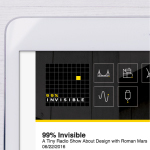 Numbers also allow for additive and subtractive combinations that, among other things, have proved very useful for graphic designers, computer displays and the printing industry. It’s worth noting, though, that color naming and numbering systems were not original or unique to figures like Ridgway or Munsell. Adapted by Munsell in 3D, the idea of a hue circle dates back to experiments by Sir Isaac Newton with prisms in the early 1700s. Pre-Ridgway color guidebooks date back centuries as well. 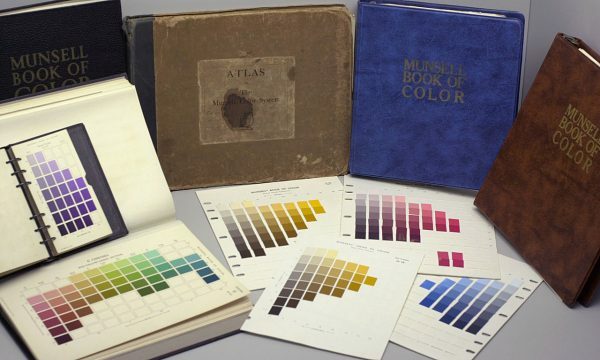 Still, these two key figures helped popularize and systematize two parallel approaches, each of which has shaped the color cataloging conventions we use today. 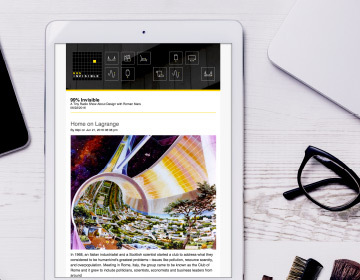 Nor are their strategies mutually exclusive: color companies like Pantone use names as well as numbers. Nice article, very well written. Human color perception is a complex process, but it’s accurately and easily explained here. Congratulations. 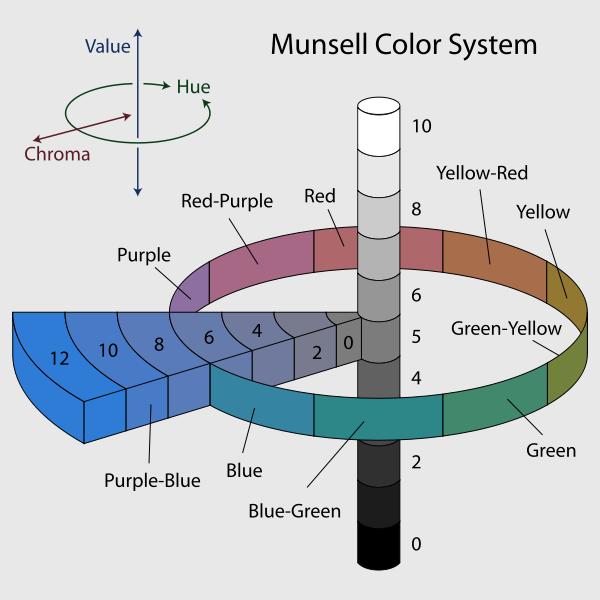 The Munsell system is a color order system that uses hue value/chroma color notations to describe colors. 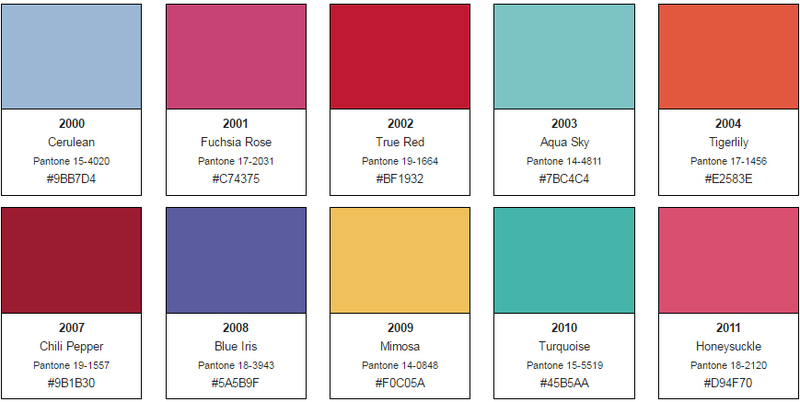 Unlike Pantone who uses a color numbering system to simply catalog their colors. There’s a BIG difference between a color notation system like Munsell and a color numbering system like Pantone.